1.1 In any ruling or response to any submissions in any Tribunal, no more than in any Court, there is always a danger that no matter what care is taken in the use of language certain expressions may be open to being construed as suggesting that final conclusions have been reached or final findings made. I wish to make it clear that I have reached no final conclusions nor made any final findings of fact nor formed any fixed opinions and this ruling should be read accordingly. 2.1 In these remarks I intend to deal with the submissions invited by the Tribunal in response to a request from Counsel for Mr. Denis O’Brien that I should express a view on the probable non-availability of Mr. Michael Andersen. In response to this invitation, submissions were received from Counsel for the Public Interest, Counsel for Telenor, Counsel for Mr. Michael Lowry and Counsel for Mr. Denis O’Brien. Counsel for the Department, whilst reserving the position of the Department made a proposal concerning the procedure the Tribunal might adopt in its continuing sittings, a proposal to which I will return below. Mr. Denis O’Brien and Mr. Michael Lowry (in submissions with which Counsel for Mr. Dermot Desmond and IIU agreed, although not making substantive submissions and ultimately reserving their position) and to a lesser degree Telenor, raised other matters, primarily contentions of breach of fair procedures on the part of the Tribunal notably, inordinate and inexcusable delay. Additional matters were also raised with respect to the proposed evidence of Mr. Peter Bacon in resumed public sittings. Although not related to the question upon which the Tribunal invited submissions, I propose to address all of these additional matters in broad terms in the course of these remarks. 3.1 Firstly, lest references in the course of these submissions to indeterminate eight year duration of the Inquiry with no prospect of finality be ascribed weight certain factors should be borne in mind. These remarks were made in the context of submissions in connection with the portion of the Tribunal?s inquiries dealing with the GSM process. As the Tribunal?s inquiries into that process did not commence until in or about May, 2001 the references to that extensive period are of course inaccurate. 3.2 In addressing the complaint of delay, the extended duration of the Tribunal has to be considered, firstly, in the context of all of the work upon which it has been engaged since October of 1997 and, secondly, in the particular context of the inquiries relating to Mr. Michael Lowry, to which the GSM portion of the Tribunal?s public sittings relates specifically. The Terms of Reference of this Tribunal are very extensive and to date have involved a number of wide-ranging, although interdependent, inquiries, each of which in itself might have warranted a full-scale Tribunal of a more limited duration. The inquiries concerning Mr. Charles J. Haughey involved, firstly, the examination of his bank accounts and other sources of income; secondly, an inquiry into aspects of the operation of Ansbacher Bank within this jurisdiction and the role of the Central Bank in relation to those activities; thirdly, the examination of the conduct of the Leader?s Allowance Account in connection with payments to Mr. Haughey; fourthly, the examination of Mr. Haughey?s relations with the Revenue Commissioners. 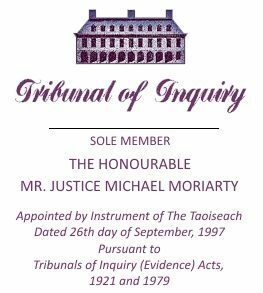 To this must be added those aspects of the Tribunal?s inquiries concerned with Mr. Michael Lowry. 3.3 On three occasions since the commencement of its work the Tribunal has been obliged to respond to substantive legal challenges. These arose from Court proceedings instituted by Mr. Charles Haughey, Mr. Dermot Desmond and Mr. Denis O?Brien. While not suggesting that any of these individuals were not entitled to avail of their legal right of access to the Courts to challenge any of the Tribunal?s procedures or proceedings, the litigation which ensued consumed a significant amount of the Tribunal?s time and resources. From shortly after the Tribunal?s work commenced, Mr. Haughey?s litigation, in the form of a constitutional challenge involving both the Tribunal and the State absorbed the preponderance of 1998 and precluded the commencement of public sittings proper until before the end of January of 1999. Thereafter the Tribunal?s hearings, concerned with payments to Mr. Haughey, the operation of the Ansbacher accounts, the Leader?s Allowance and Mr. Haughey?s dealings with the Revenue Commissioners, were more or less concluded by the 30th May, 2001, retarded of course by the unavoidable health issues concerning Mr. Haughey. 3.4 The Inquiry?s dealings with Mr. Lowry?s affairs have undoubtedly been the longest and most extensive of those to date undertaken by the Tribunal. The evolution of those inquiries has been alluded to in litigation in which the Tribunal has been involved during the conduct of those inquiries and while it has also been referred to from time to time in the course of the Tribunal?s public sittings, it is appropriate that it should be referred to extensively at this point in the context of what I propose to say below concerning the approach to be adopted to the conclusion of those hearings. 3.5 The Tribunal?s first public sittings dealing substantively with the Terms of Reference applicable to Mr. Michael Lowry commenced on the 22nd of June, 1999. The duration of those sittings was a mere five days. Having regard to the evidence given it seemed reasonable to infer that the bulk of the Tribunal?s work in relation to Mr. Michael Lowry had been concluded in those sessions. Of the matters outstanding at that time the most substantive, and the only one which at that stage it could definitively be predicted would involve public sittings was Term of Reference (j) relating to the collection of income tax by the Revenue Commissioners. In an Opening Statement delivered on the 22nd June, 1999 it was stated that in endeavouring to establish whether any substantive payments were made to Mr. Lowry and in endeavouring to establish the source of funds held in Mr. Lowry?s bank accounts, the Tribunal had sought to assemble all of the available financial information concerning Mr. Lowry?s affairs and that to that end, it had sought, and (as far the Tribunal understood) been given full access to all information regarding Mr. Lowry?s accounts, both his accounts within the State and accounts he held off-shore. In the course of hearings on that day, evidence was given by Mr. Denis O?Connor who agreed that he had been retained by Mr. Lowry in 1996 to carry out a full review of Mr. Lowry?s financial affairs and to reconstruct and to prepare a record of his finances and that in carrying out his work, he had been given full access to all information regarding Mr. Lowry?s finances including all accounts held by him in banks within the State and off-shore. It should be noted at this point, that of the matters listed by the Tribunal as warranting attention, the last itemised was the purchase of a property at Carysfort Avenue in Blackrock by Mr. Lowry. The relevant witnesses in connection with the Tribunal?s inquiries relating to Mr. Lowry at that stage had concluded their testimony by 23rd June, 1999. 3.6 On Monday the 18th of December, the Tribunal resumed public sittings to hear evidence connected, in the main, as it was put in the Opening Statement, with the Revenue Commissioners. Evidence dealing with Mr. Lowry?s relationship with the Revenue Commissioners was not reached until the 23rd of March, 2001. The evidence thereafter given was considerably truncated due to a problem which arose concerning the extent to which it was either fair or appropriate to proceed with a public examination of Mr. Lowry?s dealings with the Revenue Commissioners in circumstances where he was actively involved with the Revenue Commissioners in endeavouring to resolve a number of outstanding difficulties. It was also felt that apart from any question of appropriateness or fairness, the public intervention of the Tribunal at that stage might not be helpful to the expeditious conclusion of Mr. Lowry?s personal income tax dealings. 3.7 By the time the Tribunal had resumed sittings in May of 2001, a significant amount of new information had become available concerning a number of financial and property transactions which appeared to involve Mr. Lowry and with which certain other individuals appeared to be connected in one way or another. These individuals were the late Mr. David Austin, Mr. Aidan Phelan, Mr. Kevin Phelan, Mr. Denis O’Brien and Mr. Christopher Vaughan. By that time, there had also come to the attention of the Tribunal, through media reports, the broad details regarding what has come to be known as the Telenor/ESAT $50,000.00 payment intended for the Fine Gael Party. 3.8 As I have already indicated above, the Carysfort transaction had already been mentioned in the course of the Tribunal?s proceedings and it was effectively the last of the matters dealt with in the course of what the Tribunal believed to be its concluding hearings concerning Mr. Lowry?s financial affairs. No mention had been made by Mr. Lowry, or Mr. O?Connor, of the fact of Mr. Lowry having received a loan of £147,000.00 to pay for repairs and renovations to that property. Nor had any reference been made by Mr. Lowry or Mr. O?Connor to the role of Mr. David Austin in connection with this sum of money. Nor was any information made available to the Tribunal concerning the circumstances surrounding the payment of £147,000.00 into an off-shore account of Mr. Lowry?s in the Isle of Man, the payment having been transmitted from an off-shore account of Mr. David Austin in the Channel Islands. 3.9 The Cheadle and Mansfield transactions likewise had not been brought to the attention of the Tribunal in the course of the original examination of Mr. Lowry?s financial affairs or at any relevant time thereafter until the Tribunal, by other means learned of the details of the transactions. Indeed, these transactions were in train both while the Tribunal was engaged in private investigations and while it continued to hear evidence concerning Mr. Lowry?s financial affairs including in particular his dealings with the Revenue Commissioners. 3.10 A thread running through all of the Tribunal?s inquiries in these matters and which will require special consideration is not merely the need to review the earlier evidence in the light of the later or newer evidence but in so reviewing it to consider the manner in which the additional or new evidence came to light and, also, to consider whether steps had been taken to prevent new evidence coming to light so as to conceal the true nature of the relationships of the individuals involved in these transactions. 3.11 The Tribunal?s inquiries into the $50,000.00 Telenor/ESAT payment involved not merely the payment itself but the apparently covert route by which the money was transferred from Telenor to an off-shore account of Mr. David Austin, the initial rejection by Fine Gael of this payment and subsequently the apparently secretive manner in which the payment, disguised as an altogether different donation, was transmitted to Fine Gael. In the course of the Tribunal?s private investigatory work in relation to this payment, it came to light that an internal inquiry had been conducted by persons involved in the initial public offering (IPO) of shares in ESAT Telecom in 1997, a public offering the main attraction of which was the ESAT Telecom holding in ESAT Digifone. This inquiry involved not just directors of ESAT Telecom but also the representatives of the shareholders in ESAT Digifone namely, of Mr. Denis O’Brien?s interests, the interests of Mr. Dermot Desmond and of Telenor. In the course of that private investigatory work, the Tribunal was informed by Mr. Barry Moloney (although not by anyone else) of remarks made to him by Mr. Denis O’Brien concerning two £100,000.00 payments one of which was referable (as has been confirmed both by Mr. Moloney and by Mr. O?Brien) to Mr. Michael Lowry. 3.12 In a further Opening Statement on 14th June, 2001, it became necessary to refer to this additional material obtained from Mr. Moloney and to the need to conduct a much more wide reaching inquiry into the events surrounding the 1997 IPO. By October of that year, the Tribunal had embarked on the examination of another payment which came to light in the course of public sittings connected with the IPO. This involved share transactions connected with Mr. David Austin and as was pointed out at page 19 of Day 41 of the transcript of the Tribunal?s public sittings, the task for the Tribunal was to endeavour, so far as practicable, to establish the true nature of the transaction involving some 12,000 shares and to endeavour to establish whether in the light of an apparent conflict between Mr. O?Brien?s evidence and Mr. Aidan Phelan?s evidence, the purchase of these shares in Mr. Austin?s name was in error; whether a transaction which on its face resulted in the benefit to Mr. Austin of some $300,000.00 was not erroneous or whether in fact it was intended to confer a benefit on Mr. Austin and whether there were any connections between such a transaction and other payments to Mr. Austin which appeared to have links to Mr. Lowry. 3.13 The Tribunal?s sittings in 2001/2002 were concerned with the examination of the IPO, with the Carysfort loan and with the Cheadle and Mansfield transactions. In the course of examination of those matters, the file of Mr. Christopher Vaughan, Solicitor was made available to the Tribunal. In 2002, certain correspondence was brought to the attention of the Tribunal which warranted a certain focus on Mr. Vaughan?s role in handling the Mansfield and Cheadle transactions and in particular, certain correspondence appearing to suggest, firstly, the involvement of Mr. Michael Lowry and, secondly, an attempt to conceal that involvement. This correspondence, described in the course of the evidence as the ?long form/short form letters? was touched on in July, 2002. One of the features of the Tribunal?s inquiries in connection with the Cheadle and Mansfield transactions was the mention on a number of occasions of what has now come to be known as the Doncaster transaction. This, according to information and evidence given to the Tribunal by both Mr. Lowry and Mr. O?Brien was exclusively an O?Brien interest. 3.14 It will be recalled that the Tribunal?s inquiries into the transaction were prompted in the first instance by the publication in the Irish Times of the contents of a letter of September, 1998 from Mr. Christopher Vaughan to Michael Lowry suggesting an involvement by Mr. Michael Lowry in the Doncaster transaction. What the Tribunal has since learned is that this letter appears to have been produced in London in the course of mediation proceedings in 2002 connected with the purchase of the Doncaster Rovers Stadium property. It would appear therefore that from that date, whatever the position may have been prior to that date, the existence of this letter and the contents of it were known to Mr. O?Brien and those agents of his acting in connection with the mediation. From other information made available to the Tribunal, it would appear that in the course of preparations being made by English Lawyers for the mediation (and related litigation), there had been references to an involvement on the part of Mr. Michael Lowry in the Doncaster transaction. These references were attributed to Mr. Denis O?Connor. The letter of the 25th September, 1998 from Mr. Christopher Vaughan to Mr. Michael Lowry together with the other references to Mr. Lowry?s involvement in the Doncaster transaction were referred to in an Opening Statement on 15th September, 2004. It will be recalled that, although this letter had at the very latest come to the knowledge of Mr. O?Brien and presumably a number of his advisers and assistants in 2002, at no point in the course of any evidence given in that year in connection with the not dissimilar long from/short form letters was any reference made either by Mr. O?Brien or Mr. Lowry or Mr. O?Connor to the letter of the 25th of September, 1998. 3.15 In the Opening Statement made in September, 2004, the Tribunal alluded to the fact that the examination of the evidence connected with the Doncaster transaction would involve a re-examination of all previous evidence concerning English property transactions. Public sittings concerning the Doncaster transaction must now await the High Court Order in proceedings instituted by Mr. O?Brien to restrain the Tribunal from examining the Doncaster transaction. Those proceedings have been unsuccessful but until an Order of the High Court is made and the question whether any such Order is to be appealed is disposed of, it would be preferable to limit references to the Doncaster transaction. 3.16 One of the questions which will ultimately fall to be determined is whether, regardless of any other conclusions I may reach, all of the additional material which has come to light since 1998 could have been – and if so ought to have been – brought to the attention of the Tribunal prior to that date, and if so, to what extent and by whom. What is clear is that had that material been brought to the attention of the Tribunal, a considerable amount of time and effort might have been saved in dealing with the business of the Tribunal since that date in 2001. 3.17 One of the features of all of this material, from the information regarding the $50,000.00 Telenor/ESAT payment, the Carysfort transaction and the related £147,000.00 loan from Mr. Austin, the Doncaster, Cheadle and Mansfield transactions is, as has been pointed out in Opening Statements, the apparent connections between individuals all of whom were involved or connected with the ESAT Digifone bid for the GSM II licence. A further dimension of this sequence of transactions which is explored in the course of the inquiry and which will have to be addressed in any conclusions I may reach concerns a statement attributed to Mr. O?Brien in the course of the internal inquisition at the time of the IPO that he had contemplated a payment to Mr. Lowry and that he had in his mind earmarked money for that purpose in Woodchester but that that money, to use the expression recorded at the time, ?got stuck? with an ?intermediary?. It will be recalled that in the course of the IPO internal inquisition queries were raised concerning movements on Mr. O?Brien?s account. Sometime shortly before the time of that inquisition, but not disclosed to the inquisition, there had been a transfer out of an account in Woodchester under the control of Mr. O?Brien, the RINV account, of a sum of £407,000. It appears that this money was transmitted, at the direction of Mr. Aidan Phelan, to an account opened for the purpose of receiving it in the Isle of Man. Amongst a number of allocations from this account the sum of £50,000 firstly and secondly the sum of £100,000 were transmitted to an account opened by Mr. David Austin in the Channel Islands, again, opened specifically for the purposes of receiving these monies. The Tribunal has been informed by Mr. Denis O?Brien that these monies were transmitted to Mr. David Austin in consideration of the sale by Mr. Austin of a townhouse he owned in Spain, to Mr. O?Brien. These monies paid to Mr. Austin by Mr. O?Brien were then transmitted (in fact £147,000 of the funds, not the entire £150,000) to an undisclosed off-shore account of Mr. Lowry in the Isle of Man, opened, at a time when he was still a Minister, and apparently expressly for the purpose of receiving these funds. According to Mr. Lowry these funds were to be used in the renovation of his Carysfort Avenue property. However, sometime shortly after a contract was entered into for the renovation of that property the entire transaction was reversed, in fact on the day of the establishment of the McCracken Tribunal by the re-transfer of those monies back to the Channel Island account in the name of Mr. Austin where they appear to have remained. One of the questions that arises in light of the remarks made by Mr. O?Brien in the course of the IPO inquisition, is whether the subsequent property transactions, namely, Doncaster, Cheadle and Mansfield (and the related financial transactions) were intended as a substitution for the payment that ?got stuck?, i.e., for the £147,0000 payment that was reversed (if that is an appropriate conclusion to reach in relation to that payment); and/or whether all of those transactions from the reversed Carysfort transaction onwards were part of a train of transactions related to the conferral of a benefit on Mr. Michael Lowry. 4.1 While undoubtedly always recognised as a major decision involving Mr. Michael Lowry, and therefore as something potentially likely to be of interest to the Tribunal, the Tribunal?s extensive inquiries into the GSM II process were prompted by the connections between the individuals apparently involved in the financial and property transactions mentioned above and the ESAT Digifone bid for the GSM licence. 4.2 From general knowledge of the process, gleaned from press reports and to some extent from parliamentary debates, the GSM process appeared to have been a seamless and technically irreproachable one, a process that was bound inexorably to reach an objective conclusion, one that had been described as being effectively hermetically sealed from outside interference. In order to understand the process, the Tribunal felt it was necessary to embark first upon an exhaustive preliminary investigation followed by lengthy public hearings with a view to elucidating the evolution of the scoring system, of the evaluation structure proceeding to the actual conduct of the evaluation followed by the negotiation of the licence. In examining the process, the Tribunal has set its face against endeavouring to substitute its view for the views of the evaluators as to the result of the competition. From the documents prepared by the PT GSM Team, from the information and documents provided by Mr. Michael Andersen and from the evidence given by Officials connected with the process it appeared that the process may not have been as streamlined as at first it seemed. Moreover it appeared that the process did not proceed as seamlessly from the evolution of the evaluation structure to the ultimate result as may have appeared from public statements in the Dail and elsewhere concerning the conduct of the evaluation. It was clear from the Tribunal?s preliminary examination and from the evidence heard in the course of the Tribunal?s sittings devoted to the GSM process that the quantitative evaluation carried out, as initially envisaged by the evaluation model, resulted in a wholly different ranking to that ultimately adopted by the PT GSM. Apart from the fact that this suggested a less than streamlined process and a less than seamless evolution of the process from a substantive point of view it warranted an extensive inquiry with a view to understanding the process. 4.3 The same goes for the alteration in the approach taken in the evaluation process to the measurement and scoring of the internal rate of return (IRR). Without going into excessive detail, it would appear that the values submitted by the various applicants in respect of their IRRs were recalculated by the evaluator to reflect a ten year planning period as opposed to a fifteen year period as was originally requested. While not entirely clear, it appears from the documentation available to the Tribunal that this was done because of inconsistencies in the manner in which one or more of the applicants had calculated IRR, although the applicant or applicants in question were never asked to correct the problem. One effect of this recalculation was to alter significantly the corresponding scores that each applicant was entitled to receive in respect of IRR. For the purposes of the Tribunal?s inquiries, it was of particular interest that ESAT Digifone would only have been entitled to an E grade if scored on the IRR value submitted with their application, whereas, as a result of the recalculation, they were ultimately awarded an A. Once again this underlined what appeared to me to be legitimately characterised as possible defects in the process. 17. The period of the negotiation of the Licence including also the issue that arose concerning the identification in the Dail and elsewhere of the proposed Licensee as defined in paragraph 3 of the RFP and the question concerning the difference between the persons so identified in the ESAT Digifone application and the make up of the proposed licensee at the time of the announcement of the result of the competition. 18. The composition and capital configuration of the Licensee at the time of the granting of the Licence. 5.1 At this stage I should mention some of the remarks made by Counsel for the Department that the Tribunal should indicate how, regardless of Mr. Andersen, it intends to proceed to conclude the evidence in relation to the GSM II process. He has, as I understand it, effectively invited the Tribunal to indicate how it intends to proceed, along the lines of an Opening Statement given by the Tribunal on 1st April, 2003 in which the Tribunal refined the focus of its view of the process. I think at this time also I should mention the submissions made by Mr. McGonigal on behalf of Mr. O?Brien to the effect that the Tribunal should set out the allegations it was making. He submitted that the Tribunal should now set forth what it believes to be any allegations which it says entitles it to continue with a public inquiry into the GSM licence. Mr. McGonigal also said that if that is done, then his client will be in a position where he can properly defend himself against any of those allegations by way of cross-examination, by calling witnesses or otherwise. He further submitted that the Tribunal has not indicated how it proposes to afford Mr. O?Brien the In re. Haughey rights to which he is entitled in the event that adverse findings are made against him. ?The difference between proceedings in Court (and being a party thereto) and a Tribunal of Inquiry to which a person is called to give evidence is important. The Tribunal hearing is not a criminal trial nor is it even a civil trial, nor is the person a party. The hearing is an inquiry to which the person is a witness.? ?In this connection we have found assistance in the approach taken by the Supreme Court of Canada in Canada (Attorney General) v Canada (Commission of Inquiry on the Blood System) 1997 3 S.C.R. 440, a case concerned with the Krever Inquiry into the blood system in Canada after many had contracted HIV and Hepatitis C from blood or blood products. Although the Act under which this Inquiry was being conducted differs in many respects from the Act under which we are operating, the observations of Cory J (who gave the judgment of the Court) at paragraphs 34-54 seem to us to have general application. As he pointed out, the findings of a commission of inquiry relating to an investigation are simply findings of fact and statements of opinion reached by the commission at the end of the day; and though they may affect public opinion, they are not and cannot be findings of criminal or civil responsibility?. 5.3 While engaged in a fact-finding exercise I recognise that the Tribunal is nevertheless bound by the principles enunciated in re: Haughey  1R 217. The procedures I have adopted to date have provided for representation for persons affected by evidence given at this inquiry or likely to be given at this inquiry. I also wish to make it clear at this stage that before reaching any conclusions on the evidence given at this inquiry I intend to enunciate a procedure whereby persons likely to be affected by any adverse findings will be given notice of conclusions, which if reached, would be adverse to them so as to enable them to make submissions in relation to those proposed conclusions. I would also envisage, so as to protect the interests of any such persons, that notice of any proposals to make any such adverse findings is given in writing and not enunciated in public thereby protecting persons in respect of whom such conclusions might ultimately not be reached from the risk of the promulgation of any such adverse findings. I would also envisage that submissions in relation to any such proposed adverse findings would be addressed to the Tribunal in writing so as once again to avoid unnecessary and potentially damaging publication. Depending on the circumstances, it may entail the recalling of certain witnesses for additional cross-examination as suggested by Mr. McGonigal. 5.4 Turning to the evidence given in connection with the conduct of the GSM Competition and the negotiation of the Licence it may be reasonable to conclude that there were defects in the process. I recognise that no such process is or can be expected to be perfect. The presence of defects, even very serious defects is not necessarily evidence of improper intervention or interference in any such process. However, I have already alluded to the extent to which in a number of respects the evaluation model as originally envisaged may not have been followed. It is necessary to consider whether there were any significant deviations from the evaluation model which were prompted by outside interference or outside influence however slight. Drawing on some of the language used by Mr. Brennan in his evidence, interference or influence in this case may range from the stark or blunt type of interference to the mere massaging or nudging of a process. In this context my reference to outsiders embraces, (I do not think that this could be criticised by anyone affected by the inquiry), any individual outside of the GSM Project Group. 1. Always at least two people present on our side. 2. Always stress that discussion is by way of informal clarification subject to formalisation in the written information round provided for in the competition. 3. Always produce a brief record of attendance and discussion. 4. As a general rule contact to be ?in the office? and thus avoiding social exchanges which, almost by definition, cannot be controlled?. 7. It would also appear that following the suspension of the original competition and prior to its being revamped on foot of the EU intervention part of a document, a confidential letter from the relevant EU Commissioner, Commissioner Van Mert, to Mr. Michael Lowry, and containing what could be regarded as valuable information regarding the re-weighting of the evaluation criteria, was in the possession of Mr. Jarlath Burke, Chief Legal Counsel of ESAT Telecom, Mr. O?Brien?s own company and an individual associated with aspects of the ESAT Telecom/Communicorp part of the ESAT Digifone Consortium. It has to be stated of course that this may have involved not so much the disclosure of confidential information from within the Department but the disclosure rather of such information from within the Commission. (i). What was envisaged as a three stage process embracing a quantitative, qualitative and ultimately a combined quantitative and qualitative evaluation appears to have been abandoned in favour of a somewhat loosely contrived qualitative evaluation embracing some individual elements of the original quantitative measurements. While it would not be appropriate at this point to conclude even tentatively that this was a defect in the process it seems reasonable to suggest that it may have undermined the integrity of the process as originally envisaged. Whether it is indeed even appropriate to describe this as a deviation, without more, from the original process as yet awaits a conclusion and is something upon which ultimately there will no doubt be submissions. At the same time it appeared to prompt an adaptation of the process to the new situation resulting in an approach to the weighting of the qualitative evaluation or at least the subdivision of the weightings in the qualitative evaluation in Copenhagen in or about the 28th / 29th September, 1995 in a way which did not involve a consensus of all of the Project Team. (ii). At Copenhagen a tentative scoring or ranking was proposed. However, according to the evidence of Mr. Brennan and Mr. Towey they were unable to recognise a ranking. At that point two steps were taken with a view to clarifying the grading on the one hand and secondly the ranking or scoring of the applications. The order in which these steps were taken is not clear but from the evidence it would appear that it was at Copenhagen that the weighting of the three subdivisions of the primary criterion, in Tables 17 and 18 of the first draft of the Evaluation Report, was distributed equally. In numerical terms they each were accorded a weighting of ten. This appears to be the first time that an overall qualitative weighting had been applied, or at least the first time that a subdivision of the weights applicable to the various elements of the different criteria was applied in the context of the qualitative evaluation. It appears that this subdivision of the weights was inconsistent with the original evaluation model. If the subdivision of the weights applicable to the quantitative model were to be transposed to the qualitative model it appears that, whereas the subdivisions of the weightings applicable to the quantitative model had been agreed by the entire Project Team, there had been no similar consideration of any such subdivision by the entire Project Team in the context of the qualitative evaluation; nor of course any consensus as to the subdivision. A further concern is that it appears that the report may have been drafted so as to obscure such inconsistency and suggest such consensus. (iii). It would appear that prior to the communication of this tentative first draft result to the Project Team the ranking had been communicated to the Minister who, if the evidence of Mr. McMahon?s notes is accepted, directed that the process thereafter be accelerated. (iv). From this point onwards there appears to have been on the one hand both a certain acceleration of the process and on the other a degree of confusion on the part of a number of members of the Project Team concerning the course the process had taken, and the steps required to conclude the process together with certain reservations concerning both the acceleration of the process and the manner in which the scoring and ranking had been concluded. In general I will be obliged to address myself in reaching any conclusions concerning the latter part of the competition to the question whether, by reason of the acceleration of the process or any other interventions by the Minister one of which will be referred to below, there was a reluctance or a certain disinterest on the part of officials to scrutinise certain aspects and more specifically certain weaknesses in either of the leading two applications. (v). One of the matters to which I will be obliged to address my attention is whether I should in considering this aspect of the process attach significance to the evidence, primarily from the notes of Ms. Margaret O?Keeffe, that the Minister may have intervened intimately in the deliberations of the Project Team by urging Mr. Brennan to ensure that the Report, as the note put it, did not argue against itself, suggesting an approach which may have disregarded the tenor of Appendix 10 proposed by Mr. Andersen and further by proposing an alternative solution, characterised by the use of the expression ?bankability? to dispose of the issues identified in Appendix 10. (vi). In due course it will be necessary, subject, most critically to the evidence of Mr. Lowry, to consider whether the manner in which the result was brought to Government avoided scrutiny which a more orthodox approach to the adoption of the Report might have entailed. In this context it will be important to determine to what extent attention should be paid to the remarks of Mr. Greg Sparks. (vii). I have already alluded to the evidence of a meeting between Mr. O?Brien and Mr. Lowry in Hartigans Public House on 17th September, 1995 and a question upon which I will be obliged to reach a conclusion is as to whether, and if so to what extent, the involvement of IIU or of Mr. Dermot Desmond was discussed at that meeting and further the extent to which any such discussions were reflected in steps taken between 18th September, 1995 and 29th September, 1995 to substitute IIU/Mr. Dermot Desmond for the four financial institutions notified in the bid document. (vii) Particular attention will be paid to the period between the announcement of the winners of the competition and the actual formal granting of the Licence. While the competition was designed to identify a candidate for a Licence, to whom the State was prepared to grant an exclusive negotiation privilege, considerable controversy arose, in particular in late 1995 and early 1996 concerning the identity of the competition winners and whether the exclusive negotiation privilege had been granted to an entity other than that which had been evaluated. a. The extent to which the intervention of the EU and the consequent delay, which may have benefited some applicants, was in any way prompted by any improper intervention by any outside third party. b. The change in the manner of the measurement and scoring of IRR which appear to have benefited certain applicants but which, so far as I can see, from the evidence to date, arose purely fortuitously. c. The extent to which ESB was obliged by the Minister to facilitate the State?s conclusion of licence negotiations with ESAT Digifone although ESB was itself a participant in another consortium, which was unknown to it, ranked in second place. 6.1 At this juncture I want to refer to the Tribunal?s proposal to hear the evidence of Mr. Bacon. Before doing so I wish to deal with a submission that because I have been in receipt of reports or opinions from Mr. Bacon I have abdicated my responsibility, a responsibility that is mine alone, to reach conclusions on the evidence, to an outsider. It has also been submitted that the access to Mr. Bacon?s expertise enjoyed by the Tribunal without witnesses having had similar access was an unfair procedure. These submissions are misconceived for the following reasons. The Tribunal is not engaged in an adversarial contest with persons affected or likely to be affected by evidence given at its public hearings. Nor is it engaged in an adversarial contest with witnesses testifying at those public hearings. The Tribunal is engaged in a fact finding exercise. The presentation of evidence directed to that end is a matter solely for me. 6.2 The private investigative phase of the Tribunal?s work enables me to arrange and to configure material for presentation at the Tribunal?s public hearings in a way which is best suited to achieving the ends set out in the Tribunal?s Terms of Reference. The fact that in the course of the private investigative work I may have obtained some assistance in considering the material does not mean that I have substituted the views of experts or others for my own views. By reason of my training and experience as a Barrister and as a Judge I am keenly aware of the difference between evidence upon which my determinations must exclusively be based and any other information I may have obtained in the course of the private investigations I have carried out, or otherwise. As will appear below there was no question of Mr. Bacon?s views being substituted for my views and further, as will appear, the line of questioning adopted by the Tribunal was devised exclusively under my supervision and without regard to Mr. Bacon?s views. This is not to say that I did not regard the contact with Mr. Bacon as being of value. It is for me however to decide to what extent information obtained in the course of the private investigative phase should, if at all, be ventilated in public as part of the Tribunal?s public sittings. 6.3 To this end I think that I should indicate in broad terms how Mr. Bacon became involved with the Tribunal. The Tribunal in the course of the preliminary private investigative stage in connection with the examination of the GSM process developed a number of lines of inquiry concerning aspects of the evaluation process. These were based on a common sense approach to the evaluation process and to the contents of documentation provided by the Department including the draft evaluation reports and the final evaluation report. They were informed by a very close scrutiny of the draft reports and the final report and the computations upon which they were based. 6.4 During the Tribunal?s private examination of this matter, the Tribunal?s grasp of technical matters (i.e., technical aspects of the process as opposed to the technical aspects of cell phone technology) was informed by assistance and guidance provided by the officials involved in the PT GSM and by Mr. Michael Andersen and one of his colleagues. I was anxious to ensure that the approach being adopted was not based on a simplistic appreciation of the technical aspects of the evaluation. For this reason Mr. Bacon?s services were retained. By that time, the Tribunal?s appreciation of the technicalities of the evaluation was quite highly developed. 6.5 Mr. Peter Bacon?s first report arose from information identified by the Tribunal. Once his Report was received in or about March of 2003 the question whether it would be necessary to introduce expert evidence was considered. A decision on that matter was deferred at that point. Having concluded the bulk of the technical evidence in relation to the GSM process it was considered desirable to have the assistance of an expert. The Tribunal?s request to Mr. Bacon for a report to be introduced at public hearings as expert evidence by him was based on the lines of inquiry developed by the Tribunal and on his Report of March, 2003. 6.6 It is my view, therefore, subject to any submission which may be made, that if conclusions are to be drawn having regard to the line of questioning pursued by the Tribunal in dealing with technical matters it would be of value to have the evidence of an expert. 6.7 I understand Mr. Bacon to be an expert in this area. Like Mr. Andersen, he is an Economist by training with, like Mr. Andersen also, a background in Government service. While he has not conducted a competition of the GSM II type, i.e., a competition to identify a first private enterprise competitor to a Semi-State organisation in a particular communications arena, he has experience of competition processes, including a number in the telecoms/IT area. He has not been asked to conduct an audit of the GSM II process. Nor has he been requested to examine the evaluation with a view to concluding whether the correct result was reached by the evaluators. He has however examined aspects of the evaluation methodology and the way in which that methodology was applied. He has been directed to and has agreed to provide responses to a number of questions crafted along the lines of the questioning pursued with officials involved in the PTGSM. It is important that his evidence, if adduced, should be subject to scrutiny by Counsel for those persons likely to be affected by any conclusion which could be critical of the process and in particular, by Counsel for the Department. 7.1 Mr. Andersen assisted the Tribunal during its initial investigative work. He attended a series of private meetings with members of the Tribunal legal team; he provided an initial report for the assistance of the Tribunal outlining the evaluation process (the cost of which was met by the Department); and through his Solicitors he furnished written responses to various queries raised by the Tribunal. All of this assistance was provided over a twelve month period from June, 2001 to June, 2002. During that time the Tribunal understands that Mr. Andersen was also engaged in consultancy services on behalf of AMI with the Communications Regulator. 7.2 In June, 2002, AMI?s Solicitors requested a meeting with the Tribunal legal team which was also attended by Ms. L. Bork of AMI. The Tribunal was informed that Mr. Andersen had sold his interest in AMI to a Norwegian company, Merkantildata and that in providing assistance to the Tribunal over the previous twelve months he had been acting as a consultant to AMI and that his fees for such assistance had been discharged by AMI. Merkantildata had decided to dispose of its interest in AMI and the Tribunal was informed that it did not intend to incur any further expense in connection with Mr. Andersen?s assistance to the Tribunal in the absence of a full Indemnity or guarantee from the Tribunal in relation to its continuing costs including Mr. Andersen?s ongoing consultancy fees. 7.3 The Tribunal did not consider that it was in a position to provide such a wide ranging indemnity to AMI and it proceeded to correspond directly with Mr. Andersen and with his Solicitors in Denmark, Bech Bruun Dragsted, with a view to securing Mr. Andersen?s assistance in his personal capacity. Mr. Andersen?s response to that request was that he was in dispute with Merkantildata in relation to their acquisition of his interest in AMI and that any assistance he might provide to the Tribunal personally would be treated by AMI/Merkantildata as an acknowledgement by him of a liability for the consultancy fees that he had been paid in respect of the assistance provided to the Tribunal from June, 2001 to June, 2002. 7.4 In an effort to meet Mr. Andersen?s stated concerns, the Tribunal took the matter up with AMI/Merkantildata?s Irish Solicitors and this resulted in confirmation from AMI/Merkantildata by letter of 5th December, 2002 they did not wish in anyway to obstruct Mr. Andersen giving evidence; that they understood that the Tribunal was seeking assistance from Mr. Andersen in his personal capacity; that they had no objections; and that it was a personal matter for Mr. Andersen. 7.5 As the above confirmation appeared to the Tribunal to meet Mr. Andersen?s apparent concerns, the Tribunal forwarded a copy of that letter to his Solicitors and asked them to confirm that in the light of its contents Mr. Andersen would be agreeable to attending to give evidence at public sittings. Mr. Andersen was not satisfied by that confirmation. The Tribunal was informed that his position has not altered but that he did not rule out the possibility of assisting the Tribunal once the financial and legal issues with AMI/Merkantildata, which had been referred to a commercial arbitrator in Denmark, had been resolved. 7.6 In July, 2003 the Tribunal renewed its efforts to secure Mr. Andersen?s agreement to attend at public sittings and wrote to his Solicitors, on 29th July, 2003 clarifying the extent to which the Tribunal was agreeable to meeting Mr. Andersen?s legal and incidental costs and again referring to the letter of 5th December, 2002 from AMI/Merkantildata in which they had confirmed that they had no objection to Mr. Andersen assisting the Tribunal personally and that they accepted that it was a personal matter for Mr. Andersen. This approach did not advance matters as Mr. Andersen?s Solicitors reiterated that he would not be in a position to assist the Tribunal until the disputes between himself and AMI/Merkantildata had been resolved and that a decision from the Court of Arbitration was expected at the beginning of 2004 at the earliest. 7.7 The Tribunal persisted in its efforts to deal with Mr. Andersen?s concerns as explained to the Tribunal and to encourage his attendance and by letter of 3rd October, 2003 wrote to Mr. Andersen indicating that it proposed seeking a detailed assurance from AMI/Merkantildata that any assistance rendered to the Tribunal by Mr. Andersen would not be understood by AMI/Merkantildata as an acknowledgement by him of a liability for the cost of the assistance rendered to the Tribunal prior to June, 2002. This proposal was not acceptable to Mr. Andersen who continued to insist that he could not consider any request from the Tribunal until the completion of the pending arbitration. 7.8 By that time, the Solicitors for Mr. Denis O?Brien had made known to the Tribunal their view that in the absence of Mr. Andersen?s evidence the Tribunal might not be able to continue its inquiries into the second GSM Licence and the Tribunal brought that matter to Mr. Andersen?s attention and informed him that in the light of Mr. O?Brien?s view the Tribunal was obliged to endeavour to clarify the situation regarding Mr. Andersen?s intentions. 7.9 Following that approach, Mr. Andersen agreed to meet with members of the Tribunal legal team in Copenhagen and this was arranged for Wednesday, 29th October, 2003. The purpose of the meeting was in part to discuss the terms that might govern Mr. Andersen?s future assistance to the Tribunal. In the course of the meeting it became apparent that in addition to the earlier preconditions of Mr. Andersen?s assistance, namely, an indemnity in relation to his costs and the postponement of any assistance until the completion of the commercial arbitration, he was now seeking a much broader indemnity from the State in respect of any claims against him, whether direct or indirect, arising out of the evidence he might give or arising from any proceedings connected with the process leading to the granting of the second GSM Licence (such an indemnity to extend to Merkantildata, the then owners of AMI). 7.10 What was apparent from the Tribunal?s dealings with Mr. Andersen dating from June, 2002 was that his stated reasons for non- attendance as a witness to the Tribunal and the matters which he was stipulating as conditions to his attendance altered as each such condition appeared, at least to the Tribunal, to have been met. His initial objection was that his assistance to the Tribunal would be interpreted by AMI/Merkantildata as an assumption by him of liability for the consultancy fees which he had been paid for the assistance provided under the aegis of AMI from June, 2001 to June, 2002. When it appeared to the Tribunal that that concern had been met by the confirmation received from AMI/Merkantildata by letter from their Solicitor dated 5th December, 2003, Mr. Andersen was not prepared to accept that such confirmation met his concerns and he stipulated that he could not consider providing any assistance until the commercial arbitration pending between himself and AMI/Merkantildata was complete. When the Tribunal then sought to clarify the terms on which he would attend as a witness after the completion of the arbitration, a further condition was introduced, namely the furnishing of a blanket indemnity from the State in respect of any liability that Mr. Andersen might have arising from evidence he might give to the Tribunal or arising from any other proceedings connected with the second GSM evaluation process. 7.11 The Tribunal proceeded to relay Mr. Andersen?s requirement for an indemnity from the State to the Government. Following receipt of an opinion from Mr. Oluf Engell, of Hjejle, Gersted & Mogensen that a procedure might be available under Danish Law whereby Mr. Andersen on a request from the Irish Authorities might be compelled to attend before the Danish Courts for the purposes of giving evidence, the Government decided that it would defer a decision on Mr. Andersen?s request for an indemnity pending the bringing of proceedings before the Danish Courts to seek to compel the provision of Mr. Andersen?s evidence. 7.12 The Tribunal also retained Mr. Engell to advise on the compellability of Mr. Andersen and the prospects of securing evidence through Danish Court process in a form which would be of assistance to the Tribunal. The Tribunal received an initial opinion from Mr. Engell in May of 2004. In that opinion Mr. Engell emphasised that while there was a procedure that might be available at the behest of the Tribunal, there was no guarantee that the Danish Courts would act upon such a request and that a successful outcome would depend on a novel development of Danish Law. There were a number of substantive and technical issues of concern to the Tribunal in relation to the procedure potentially open to it and following Mr. Engell?s initial opinion, there were a number of exchanges between the Tribunal and Mr. Engell addressed to those matters. Ultimately, Mr. Engell attended a consultation with the Sole Member and members of the Tribunal legal team in Dublin in March, 2005. In order to ensure that there was no misunderstanding or confusion regarding Mr. Engell?s advice and in order to ensure that the Tribunal had a full understanding of all the issues, both substantive and technical, the Tribunal wrote to Mr. Engell on 7th April, 2005 setting out the Tribunal?s precise understanding of the matters which had been discussed and of Mr. Engell?s advice on those matters and asked Mr. Engell to confirm that the Tribunal was correct in its understanding of all of the advices he had furnished dating from May, 2004. By letter of 15th April, 2005 Mr. Engell confirmed that the matters set forth in the Tribunal?s letter constituted a correct understanding of his advices. 7.13 It was apparent from Mr. Engell?s advices that there was no realistic prospect of the Tribunal securing Mr. Andersen?s evidence through procedures before the Danish Courts. The Tribunal accepted Mr. Engell?s advices and conveyed the position to the Government and the Government then proceeded to a decision that it would not grant the indemnity sought by Mr. Andersen. 7.14 The Tribunal duly informed Mr. Andersen of the position and inquired as to whether notwithstanding he would be prepared to make himself available as a witness. The Tribunal received no response to its initial letter and wrote again informing Mr. Andersen that in the absence of a response to its previous correspondence the Tribunal would proceed on the assumption that he would not be attending to give evidence or otherwise assisting the Tribunal. The Tribunal has received no response from Mr. Andersen and has accordingly proceeded on that assumption. 7.15 I accept the legal submissions made on behalf of the Attorney General representing the Public Interest as to how I should be guided in approaching the question of the consequences of the absence of Mr. Andersen. I am fortified in that view by the principle that in criminal and civil cases the death, or the mere absence, of a witness does not, in general terms, even in the case of a person facing a murder charge, compel the abortion of the legal process. This principle, in the context of inquiries conducted by a Tribunal established under the 1921 Act is exemplified in the passage from the judgment of Geoghegan J. in Goodman International v. Hamilton (No. 2)  3 I.R. 307, to which I was referred by Counsel for the Public Interest. 7.16 From this vantage point the absence of Mr. Michael Andersen does not constitute a basis for terminating the inquiry. Obviously, his absence may have an impact in relation to the Tribunal?s capacity to reach certain conclusions or in relation to the confidence with which certain conclusions can be reached but it would be impossible at this stage to predict with any precision what conclusions might be liable to be so affected. A distinction has to be made between Mr. Andersen?s Reports, i.e., the evaluation reports and the draft Evaluation Reports together with Mr. Andersen?s audit of the evaluation process and advice or information provided by him to the Tribunal either at meetings or otherwise in the course of the investigative process. The latter class of information, standing alone, could not now be taken into account or regarded as evidence for the purposes of any findings I may be obliged to make. That is not to say that it could not be used to form the basis of questions for witnesses. In particular, I see no reason why, subject to any submissions that may be made, it would not be appropriate that any such information should be put to Mr. Bacon for comment, or used in challenging any views expressed by him in evidence. 7.17 So far as the ultimate conclusions that I may have to reach are concerned I may in due course require submissions as to whether Mr. Andersen?s absence as a witness and in particular the conditions subject to which he has indicated a willingness to give evidence warrant any criticism that might tend to reflect on the evaluation process. 7.18 I have considered the proposal of Counsel for Telenor, Mr. Fitzsimons, that Mr. Bacon be asked to speak with or make contact with Mr. Andersen. In the event of Mr. Andersen agreeing to this course the question arises whether Mr. Bacon?s views as tempered or qualified or otherwise affected by his dealings with Mr. Andersen could be regarded as evidence to which I should have regard. I feel that I am correct in assuming that no person likely to be affected by such evidence would be prepared to consent to such a course until Mr. Bacon had given evidence of the results of or the impact of any such contact and this strikes me as a course unlikely to be of practical benefit. 8.1 It has been submitted that the Tribunal write to the Government to request the Government to revisit the issues of the provision of an indemnity. Having regard to the formal Government decision on the matter I do not think that there have been any material changes in the relevant circumstances upon which I could reasonably base a request to the Government to reconsider the matter. 9.1 I have given consideration to the proposals put forward on behalf of Telenor that the Tribunal explore the possibility that an insurance arrangement could be put in place to satisfy Mr. Andersen?s requirement for an indemnity. I have taken this matter up with the Government and in due course will make known the results of my own and the Government?s deliberations. 10.1 In submissions made to the Tribunal on behalf of Mr. Denis O’Brien, it was suggested that the Tribunal has delayed unreasonably in concluding its inquiries into the licensing process and that no explanation for such delay has been provided. While there has undoubtedly been a lapse of time between the conclusion of the Tribunal?s last public sittings and its intended resumption on 21st September last, that delay occurred for reasons outside the control of the Tribunal. As persons with whom the Tribunal is dealing will be aware, the Tribunal had intended to deal with the balance of its inquiries into the process in conjunction with separate inquiries in relation to Doncaster Rovers Football Club. As there are witnesses common to both inquiries, notably Mr. Denis O’Brien and Mr. Michael Lowry, it seemed sensible to the Tribunal and fairer to those witnesses (who had already given evidence on previous occasions) to hear the entire of the balance of their evidence in relation to both matters at the one sitting. The Tribunal commenced sittings on 15th September of 2004 to deal initially with Doncaster Rovers Football Club matter and to move on to hear evidence in relation to the outstanding aspects of the GSM inquiry. The Tribunal was also mindful of the need to dispose of its sittings in relation to the Doncaster Rovers Football Club matter as it was concerned about the availability of witnesses who were outside the jurisdiction and whose attendance was not compellable by the Tribunal. 10.2 Judicial Review proceedings were issued by Mr. O’Brien which effectively prevented the Tribunal from continuing with those sittings. Mr. O?Brien was refused leave to seek Judicial Review in the High Court and the Tribunal expected to be in a position to proceed with its sittings and complete the GSM inquiry without further significant delay. Following the delivery of the High Court judgment on the 26th November, 2004, Mr. O?Brien appealed to the Supreme Court which delivered judgment on the 12th May, 2005. That judgment enjoined the Tribunal from proceeding with public sittings in connection with the Doncaster Rovers Football Club transaction until the completion of Mr. O?Brien?s current application for Judicial Review. The Tribunal also considered that, insofar as was feasible, it was preferable not to hear evidence in connection with Mr. O?Brien?s affairs during the currency of those proceedings. 10.3 In the interim, the Tribunal had proceeded with its private inquiries which involved lengthy exchanges of correspondence and the close scrutiny of information and documentation. While inquiries continued in connection with the Doncaster Rovers Football Club transaction the Tribunal also commenced private investigations in relation to a number of other matters pursuant to the paragraphs of its Terms of Reference which relate to Mr. Charles Haughey. 10.4 As of May, 2005, when the Supreme Court judgment was delivered and it was apparent that it would not be feasible for the Tribunal to postpone hearing the balance of the evidence in relation to the GSM inquiry pending the final disposal of Mr. O?Brien?s proceedings, certain aspects of the Tribunal?s inquiries in relation to matters pertaining to the affairs of Mr. Charles Haughey had reached an advanced stage and the Tribunal proceeded to hear evidence at public sittings in relation to those matters in June, 2005 which sittings were completed on 1st July, 2005. The Tribunal then envisaged the 21st of September last as the commencement date for the resumption of its sittings to hear the balance of the evidence in relation to the GSM inquiry. 10.5 It has been submitted that this delay has deprived Mr. Lowry of his right to a meaningful cross-examination of Mr. Boyle and Mr. O?Brien. The same submission has been made on behalf of Mr. O?Brien in respect of his Counsel?s continuing of his cross-examination of Mr. Boyle. 10.6 I have considered the evidence of Mr. Boyle. Primarily it concerns remarks allegedly made by Mr. Dermot Desmond and a meeting between Mr. Boyle and Mr. Lowry. The remarks allegedly made by Mr. Dermot Desmond refer to Mr. Denis O’Brien and Mr. Lowry. Mr. Dermot Desmond denied the making of any such remarks and has given evidence to that effect. In the examination of Mr. Boyle by Counsel for the Tribunal and in cross-examination by Counsel for Mr. Desmond it emerged that such remarks, assuming they were made, was capable of a non-pejorative interpretation at least in the judgement of the witness. In the event that I deem it necessary to make a finding in relation to the making and/or the meaning of these remarks, it will be for me to conclude whether, on the basis of an appropriate standard of proof, they could only bear a pejorative interpretation. 10.7 Nothing has been submitted to me to warrant my deciding at this stage that the rights of Mr. O?Brien or Mr. Lowry to cross-examine this witness have been nullified by reason of delay. Of course in the event, that upon any examination of this witness it appears that in fact that those rights have been nullified or seriously diminished, I will of course be obliged to disregard the evidence of such witness in any conclusions I reach or any findings I am obliged to make or any views I may be obliged to express in my report. 10.8 The other area where Mr. Boyle gave evidence concerning Mr. Lowry involved a meeting which he had with Mr. Lowry in the Fitzpatrick?s Castle Hotel. Mr. Lowry has not given evidence in relation to this meeting. He has however furnished the Tribunal with a Memorandum of Intended Evidence in which he has informed the Tribunal that such a meeting did take place and of what transpired at that meeting and his account is not materially in conflict with the evidence given by Mr. Boyle. It is therefore difficult if not impossible to conceive how any cross-examination rights of Mr. Lowry could be affected by delay. 10.9 Mr. Lowry has also submitted that the deferral of the resumption of evidence in relation to the GSM process has deprived him of his right of cross-examination in respect of the evidence of Mr. O?Brien. Mr. O?Brien has not yet completed the balance of his evidence he, having requested when last under Oath, an adjournment to enable him to consider certain documents. From a review of the evidence of Mr. O?Brien, it would appear that Mr. O?Brien made no remarks critical of or in any way reflecting on Mr. Lowry?s reputation and it is therefore difficulty if not impossible to conceive how any cross-examination right of Mr. Lowry could have been affected by delay. 11.1 I want to mention four other points which seem to me to be of importance in the more general submissions made on 13th September. 11.2 Firstly, it has been submitted and I think correctly that there is no general entitlement to investigate the GSM process. The Tribunal in a ruling on procedures on 29th September, 1998 indicated how it proposed to approach the sequencing of inquiries. It will be recalled that I indicated that the Tribunal would in general proceed from the money trail to examine decisions. Counsel for Mr. Lowry has in his submission drawn my attention to the fact that in examination of a decision the Tribunal should only proceed from a situation in which there were financial links with the beneficiaries of decisions. While I would not be prepared to accept that the Tribunal was bound to reach a conclusive view as to the nature of financial links with beneficiaries of decisions before proceeding to examine those decisions, I do think that this is nevertheless an attractively compendious way of describing the actual process whereby the Tribunal proceeded from an examination of property and financial transactions, ranging chronologically from the ESAT/Telenor payment of $50,000.00 in October, 1995 through the Carysfort transaction, the David Austin share transaction, the Doncaster transaction, the Cheadle transaction and the Mansfield transaction to the subsequent examination of the decision with which most of the individuals involved in those financial transactions were linked. In this connection I think it is also important to draw attention to the fact that however tempting, and I acknowledge understandably tempting, it may be to refer to the work of the Tribunal as involving an inquiry into malfeasance or corruption or untoward acts on the part of, in this case, Mr. Lowry, that formulation is inappropriate. It was used by Counsel for Mr. Desmond/IIU in the course of his submissions and, while for the reasons hinted at a moment ago, I appreciate how easy it is to fall into a somewhat causal approach to the Terms of Reference, the fact remains that in this context what the Tribunal is mandated to inquire into is, on the one hand, any substantial payments made to Mr. Lowry in circumstances giving rise to a reasonable inference that the motive for making the payment was connected with any public office held by him or had the potential to influence the discharge of such office, or the sources of any money held in certain bank accounts under Terms of Reference (e) and (f) and, on the other hand, any acts done or decisions made by him to confer any benefit on any person making such payment or any person who was the source of any such money under Term of Reference (g). In reaching any conclusions on the evidence, I will be focusing on those provisions of the Terms of Reference. 11.3 Secondly, it has been submitted that the Tribunal should apply to the Oireachtas for the provision of an indemnity. I have no standing to make any application to the Oireachtas to the effect that the Oireachtas should take any such step. It would be a usurpation of the role of the Oireachtas on my part to make any pretension to suggest to the Oireachtas how it should proceed other than within the strict confines of my Terms of Reference. This is quite apart from the fact that the introduction of any measure in the Oireachtas is a matter, in the first instance, and in practical terms, for the Government and in any case theoretically only for any other member of the Oireachtas. Any other matters which the Tribunal believes should be drawn to the attention of the Clerk of the Dail at that stage (including any matter relating to the Terms of Reference);? 11.5 This provision of the Terms of Reference has been complied with. I am satisfied from my reading of the Terms of Reference that there is no basis upon which the Tribunal can issue an Interim Report. I am also satisfied that my interpretation of the Terms of Reference gives effect to what I believe to have been the intention of the Oireachtas in drafting the Terms of Reference. The Terms of Reference regarding each of the two named individuals, the primary focus of the inquiry, together with the recommendatory provisions, are so interdependent that it would be inappropriate to distinguish between them and in addition could be unfair to those individuals. 11.6 Finally, both Mr. O?Brien and Mr. Lowry took exception to what was contended to be the unwarranted adverse consequences of the length of Tribunal hearings particularly in the context of the former?s on-going business activities and the latter?s requirement to offer himself as a Dáil candidate in North Tipperary. In this respect, it may be noted that neither the conclusions of that constituency electorate, nor the preponderance of media reports, lend support to a view that the reputations of either have been unfairly damaged by dealings with the Tribunal. In the one case Mr. Lowry has been returned to the Dail and I note from recent reports that Mr. O?Brien has been appointed to one of the most responsible positions in Irish business.